Central Asian ikat wall-hanging, Freer-Sackler Galleries, Smithsonian Institution, Gift of Guido Goldman. This is a great season for textile lovers in Washington D.C. Not one, but two major new textile exhibitions opened recently, one at the Smithsonian’s Freer-Sackler Gallery, the other at the Textile Museum at George Washington University. Both revolve around Central Asian ikat, a traditional weaving technique with variants across the world. The ikat technique reached its highest expression in the 19th century kingdoms of Bukhara, Samarkand, and the Ferghana Valley region of present-day Uzbekistan. 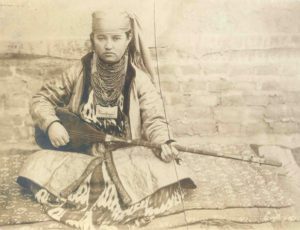 Young Woman Playing a Musical Instrument, Photographer S M Dudin, c. 1893-1900, courtesy Anahita Photo Archive. The production of ikat is extremely labor-intensive. Silk or cotton threads are tie-dyed in multiple colors, each shade requiring a new pattern of dye-resistant wraps to be tied around the skein. The threads are then wound onto the loom, each thread of the warp carefully aligned with its neighbors, to allow the pre-dyed pattern to emerge. The slippage of the colorful warp in the weaving process creates blurred margins between color fields, one of the subtle qualities which set ikats apart from other textiles. 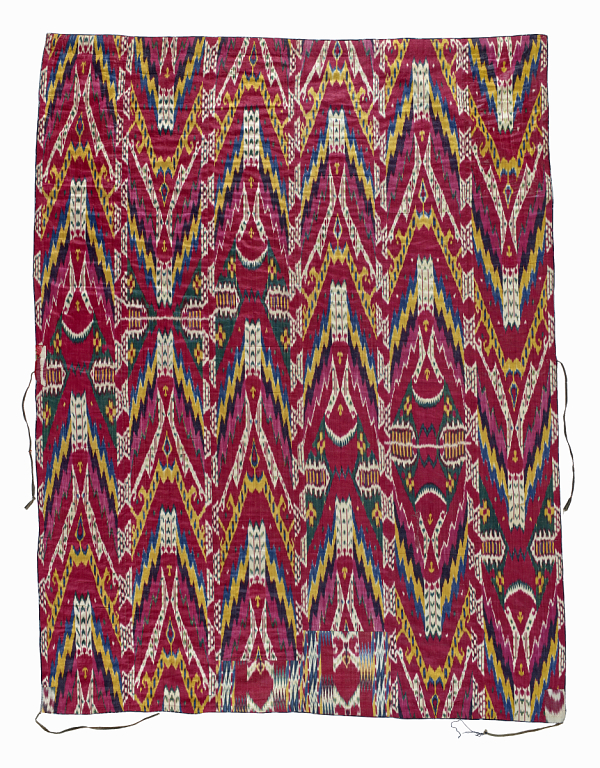 Apart from this delicate shading, Central Asian ikats are known for their rich colors, unconstrained patterns, and the elegant, simple cut of the coats, hats, and other garments made from the finished fabric. No art form, no matter how beautiful, can achieve recognition without enthusiastic patronage and support, and ikat is no exception. 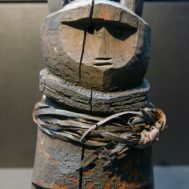 Neither of this spring’s ikat exhibitions would have been possible – indeed, it is unlikely either would even have been contemplated – without Dr. Guido Goldman. 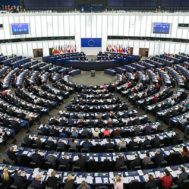 Goldman, an historian and political scientist, is founding director of the Center for European Studies at Harvard University, and founder of the German Marshall Fund of the United States. Goldman is also a dedicated patron of the arts, long serving as chairman of the board of the Alvin Ailey American Dance Theater. Munisak, Woman’s Robe, Silk Velvet Ikat, Freer-Sackler Galleries, Smithsonian Institution. Goldman was among the first Americans to collect ikats. He began in the 1970s, when the textiles were hard to find, but more affordable because of their obscurity. He was struck by their free-flowing color fields, which called to mind the raucous canvases of the Expressionist painters he admired, such as Wassily Kandinsky. As the years passed, Goldman assembled the largest collection in the world of extraordinary, early examples of ikat wall-hangings from the golden age of ikat production in Central Asia. The collection was supplemented and expanded with a wide range of early to third-quarter 19th century ikat robes, including silk velvet ikat coats, some of the most sumptuous garments ever made. Jews negotiating bride price or dowry, c. 1881, photographer Kuhn (Kaufman Albom), Library of Congress, and a similar ikat fabric from the Goldman Collection. With the help of private curator Gail Martin, and textile specialists Mimi Leveque and Annie Carlano, a series of exhibitions were held in major US museums over the next decade. Goldman’s insistence that ikats were art resulted in their often being the first ‘textile’ exhibition to be featured in the main museum galleries. The ikats traveled to the Boston Museum of Fine Arts, San Francisco’s De Young Museum, the Art Institute of Chicago, the Denver Art Museum, the Jewish Museum in New York, and the Freer-Sackler at the Smithsonian. When the series of exhibitions was completed, each of these museums and a number of other major US institutions, received a gift of a selection of ikats from the collection sufficient to curate a full exhibition, following on Goldman’s desire to share the artworks with the broadest public audience. Goldman was hopeful that the early ikats, which are less well-represented in museums in Uzbekistan, could eventually be shown there too. 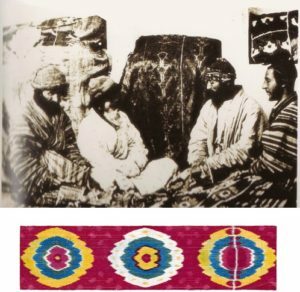 (The ikats in the Goldman Collection all had been brought to Afghanistan and other countries after the Bolshevik Revolution). The Freer-Sackler received a very large gift of 76 ikat hangings and robes in order to facilitate international and national loans. A final gift from his collection – Goldman no longer holds any ikats – went to the newly reorganized Textile Museum at George Washington University. This institution, with a distinguished history of textile research, seemed a fitting repository for his remaining and “most favorite” ikats. It is this scholarly, research-oriented side of Goldman’s collecting practices which is highlighted in the Textile Museum’s show. The title of the show: “Binding the Clouds: The Art of Central Asian Ikat,” comes from the Persian term for ikat: ‘abrbandi,’ ‘binding clouds.’ (The word ‘ikat,’ the default English term for this form of textile, regardless of its origins, derives from an Indonesian term which can mean either ‘thread,’ or ‘to tie’.) This exhibition’s emphasis is on the technical and the incredibly sophisticated development of the abstracted forms of ikat design. Thanks to Dr. Goldman’s 2015 donation of seventy-five items from his ikat collection, the museum is able to present a history of the developments in ikat design across the entire nineteenth century. Oscar de la Renta Ikat Dress, Freer-Sackler Galleries, Smithsonian Institution. Oscar de la Renta was among the earliest designers to recognize ikat’s potential for modern fashion design. His earliest collection of ikat prints – Spring 2005 – was shown in Paris and New York not long after Goldman’s collection completed its national tour. What can truly be called an ‘ikat-mania’ began soon after. 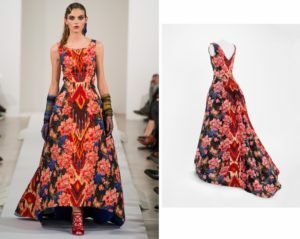 Fashion designer Oscar de la Renta broke new ground by incorporating ikat-inspired patterns into his runway and ready-to-wear collections. Many fashion houses, including Armani, Gucci, and Alexander McQueen followed his lead, and applied ikat patterns to their designs. Once known only as one among many varieties of ‘ethnic’ textile production, ikat weavings – or, more often, ikat-inspired prints – have become a common element of modern design. The trend has since been embraced by the popular clothing and furnishing industries. It is now possible to purchase an ikat-patterned pillow, phone case, or backpack – or even a roll of duct tape. The vast majority of new ‘ikat’ goods on the market are not true ikat weavings, but printed with patterns derived from true ikats. The process of making ikat fabric is far too difficult for large manufacturers to attempt. 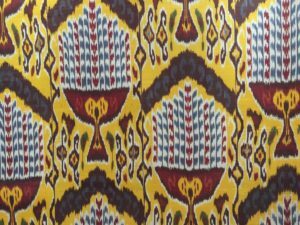 However, the surge of interest in the purely visual qualities of ikat has led to a resurgence of traditional weaving practices as well. 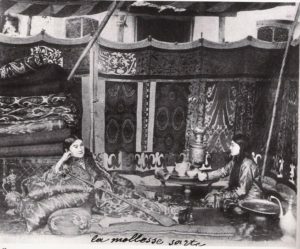 “La Molesse Sarte,” Photograph of young women inside a textile decorated kiosk, c. 1880-1890, collection Pip Rau, London. Traditional ikat production was almost eradicated by the economic disruption of late 19th century colonization of Central Asia and the repressive collectivization of artisans imposed by the Soviet Union. Yet today in the Ferghana Valley region of Uzbekistan, an ikat revival is thriving. Tourists, designers, and locals can once more purchase handmade ikats by the meter at markets and in upscale shops. Oscar de la Renta is among the new producers’ customers, and the passion for ikat has led designers to further Central Asian discoveries. Valentino’s 2015 couture collection heavily featured suzanis, the elaborate floral embroideries traditionally produced in the region. The new government of Uzbekistan has been more willing to support the activities of all kinds of entrepreneurs, including ikat workshops, than in the past. There are now 250 companies from 23 countries working in Uzbekistan in the textile industry. Over a third of Uzbekistan’s light industry enterprises are textile enterprises, primarily located in Uzbekistan’s Ferghana Valley. Yudgorlik Textile Factory, Marghilan, Ferghana Valley, Uzbekistan. Wikimedia Commons. In Uzbekistan’s Ferghana Vallery, there are at least 700 people in the town of Marghilan alone, who make ikat as their specialty craft. It creates a very positive working atmosphere in the industry that people are respected as professionals and they are able to work creatively. There are 450 workers in the largest textile craft enterprise, the Yodgorlik factory in Marghilan. These workers are mostly women, making silk and cotton textiles. 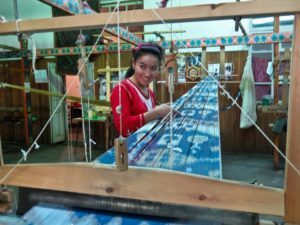 At the Yodgorlik factory, the company heads encourage young men and women who have studied drawing at textile colleges to try to develop designs. At most one of ten attempts is good enough to make into a piece – but the factory will make cotton samples from them and give the artist whose design it is the first 10 meters of textile. 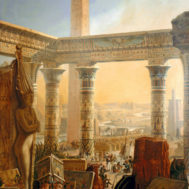 The designs are divided into different conceptual categories, classical following the old masters, middle-age designs (which are a mix of progressive and classical) and ones best described as totally avantgarde. 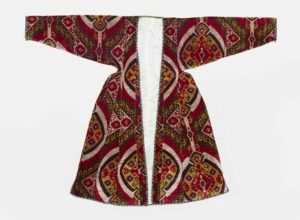 Modern designers in Uzbekistan are also working with local textiles. There is a high fashion industry for ikat dresses in Uzbekistan, as well as production of the traditional tunic-like design. There are also some quite ‘unusual’ costumes using ikat in both Western and Eastern haute couture and ready-to-wear. None of this would have been come about were it not for the efforts of Dr. Goldman. Most importantly, the worldwide love of ikat which he helped to inspire has sparked a revival of ikat weaving in Uzbekistan which will ensure that these traditional techniques are not forever lost. A contemporary “Goldman Ikat” made by Rasul MirzaAkhmedov in the Ferghana Valley. Credit Binofsha Nodir.